Although Toni, a former model, Miss California and the former owner/publisher of the well-known "Orange Coast Magazine" has enjoyed many successful careers, she professes "The Poodle Tales" project to be the greatest fun thus far. Her love for children and animals, especially Poodles became her inspiration. The need for children in today's times to have new and positive role models who teach great life lessons became her motivation. She sincerely hopes you enjoy this light hearted twenty-four book collection as much as she enjoys presenting it to you. To my soul mate and husband Bruce, as his love and support has made “The Poodle Tales” possible. To my mother and father, as their understanding of my love for animals has enabled me. To Roxanna, William and Gaby our Poodle caretakers. To Brian, my sweet son, whose help has been invaluable. 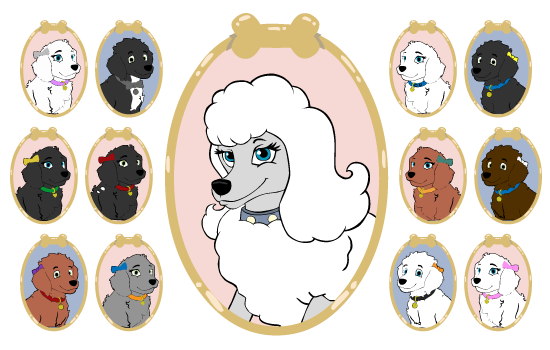 To Paula Wilder of “Royale”, Maggie Laney of “Highfalutin” and Denise Prall of “Devine” for my three Poodle loves: Dante, Deja vu, and London.